I’m sure the storm looked exactly like this. However, I was snoozing. Our power went out at 5:30 this morning, in the midst of an enormous, rainy, loud, crashing thunderstorm. Unconcerned, my husband and I snuggled a little tighter, listening to the soothing sounds of the rain, which we could hear ever so much better because the central air conditioner and our ceiling fan were not moving. Le sigh. Soon, thanks to the stagnant air, “snuggling” became “sticking”. We untangled ourselves and hurried to get ready for work. (We take showers at night). I couldn’t see to put on makeup and had no power to blow dry my hair. No problem, I thought. I’d doll up in the car and straighten my hair at work in the bathroom. a) The side door to our garage is always locked. b) The big garage door won’t go up when the electricity is out. c) You can’t open it by hand unless you’re inside the garage. d) You can’t get IN the garage unless you have a key for the side garage door. e) We can’t find the key for the side door, and…. f) My car is in the garage. He tried all the keys we had. None worked. We sipped furiously on our tepid, weak coffee, plotting our next move. I tried unsuccessfully to McGuyver the lock with a Swiss army knife and a bobby pin but decided I’d better quit screwing with it before I snapped the bobby pin off inside the lock, making a bad morning even worse. Long story short, we found the garage key. Sometimes, luck is on your side. Or hanging up on the key rack. 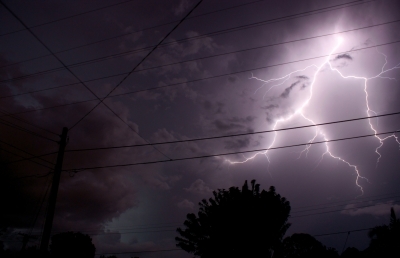 This marks the second time in a week that we’ve lost power…last Wednesday night; ten minutes after I had applied hair color to my head and eyebrows, a furious thunderstorm came ripping through the neighborhood, knocking our power out. I ran shrieking into the bathroom to wipe the color off my eyebrows, ensuring I didn’t turn out like Burt & Ernie. Hair, I could fix, recolor, cut, or hide under a hat. Eyebrows? Not so much. Dominos made dinner tonight, as the power was still out at dinnertime. However, the power came back on (let me say that again, because the words are so delicious, the power came back on) around 8. Thanks, Dominos. The pizza was delicious. Thanks to Com Ed for getting the electricity up and running again.